As of today, I have finished Day 12 of Insanity: The Asylum, Volume 2. While Volume 1 is entitled “Sports Performance“, Volume 2 is entitled “Elite Training Series“. 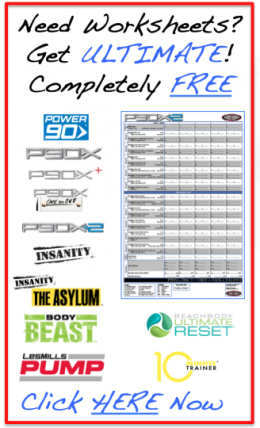 If you have not downloaded my CUSTOM Insanity Asylum, Volume 2 Worksheets, you can do that HERE. I think the best way to do a review this program is to start with some Q&As. Then, I will go through each workout. Question: Is Volume 2 harder than Volume 1? Answer: In Yy Opinion, No. In fact, many of the workouts are a bit easier. However, it is different and the focus on agility and footwork will keep your brain churning during the workout! Question: Do I need to do The Asylum: Volume 1 before Volume 2? Answer: You definitely do not need to do Volume 1 in order to do Volume 2. It is not as if they build on each other. In fact, they have a great 60-Day Hybrid schedule for Volume 1 and Volume 2 if you wanted to do both at the same time. 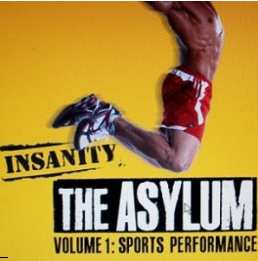 Question: Do I need to do Insanity before The Asylum: Volume 2? Answer: While I wouldn’t give an unequivical YES, it probably is a good idea for most people. If you are in good shape and have done High Intensity Interval Training, then you may be able to step into the Asylum without Insanity as a base. Question: What equipment do I need? Answer: You use the same equipment as The Asylum Volume 1: Speed Rope, Agility Ladder, Strength Bands (I suggest Red and Green), and dumb bells or resistance bands. A Pull-Up Bar is optional as in Volume 1. You can go to the Equipment section of my website HERE to check stuff out. The pricing is very reasonable and Insanity remains to be one of the lowest cost equipment programs. Question: Are The Asylum: Volume 1 and Volume 2 really different? Answer: What I like about The Asylum series is that each workout is different and there is some great variety. After 60 Days of Insanity, I started to feel all the workouts where the same basic moves. After all, there is only so much you can do with no equipment. So there are some parallels to Volume 1 and Volume 2 that I will highlight below. 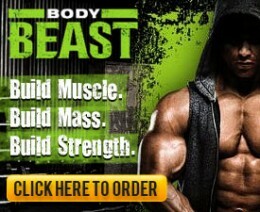 But I will say that there was not one workout where I felt I got a Volume 1 workout that was just “redone” . X Trainer is 49:09 and while I expected “Speed And Agility – Part 2″, it is much more diverse! It will get your brain moving as much as your body. Definitely do the Agility Tutorial first! I am not coordinated and I have no rhythm, so I needed to really concentrate on these moves. But unlike Speed And Agility, this is not all footwork. ShaunT throws in alot of push-ups in this one. And these aren’t just standard push-ups: Moving Matrix Push-Ups, Leaping Push-Ups, and Single-Arm Assisted Push-Ups. 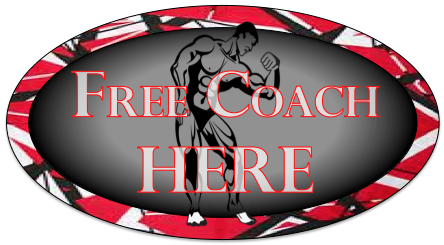 He also has a “Pyramid Weights” sequence that works your chest, back, and shoulders. X Trainer brings it to you. You just need to keep up! There has been a lot of debate as to whether “Upper Elite” is harder than “Strength“ from Volume 1. One major difference is that “Strength” had lower body work as well. And for anyone who has done that workout knows that the 3 Rounds of Progressive Dumbbell Rotations is a tough bar to beat in terms of difficulty. My initial impression that “Elite Upper” was in fact easier then “Strength”. However, as I kept increasing my weight on Elite Upper, I may be reconsidering that opinion. This workout is a full 60 minutes long and has 6 rounds plus a 5+ minute burnout sequence at the end. ShaunT starts each round with some kind of push-up and then moves into a Chest Press, Bicep Curl, Shoulder Move and finally a Tricep Move. Some rounds he will through in some agility moves as well. He then finishes you off with a burnout consisting of 9 exercises. 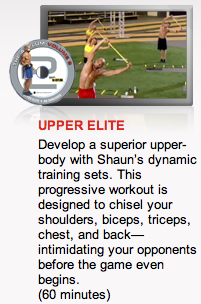 Upper Elite is true resistance circuit training. Be forewarned, it will bring you to your knees by the end! 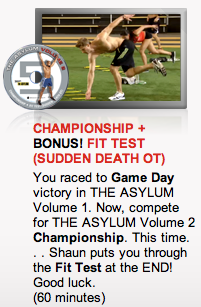 Shaun T called “Power Legs” his least favorite workout in Asylum, Volume 2. So how does this compare to “Vertical Plyo” from Volume 1? Well, in my opinion “Vertical Plyo” takes the cake of one of the hardest Insanity workouts. And while “Power Legs” is tough, “Vertical Plyo” still wins in my books. In this 49 minute workout, you will be tested by using a strength bands around your ankles. If you really dig deep, the burn will come really quick. In the second half of the workout, ShaunT introduces dumbbells in the form of Kettlebell Swings and Weighted Squats. The last 5:30 minutes is reserved for true craziness. ShaunT takes you through 11 moves each lasting 30 seconds long with a weight of your choice. By the end of 5.5 minutes, my legs are literally shaking and sweat is stinging my eyes from pouring off my forehead. 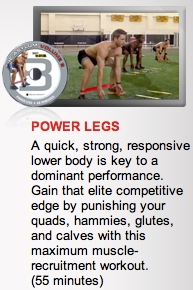 “Power Legs” helps you with every other activity you do! A dedicated Ab routine was missing from Volume 1. 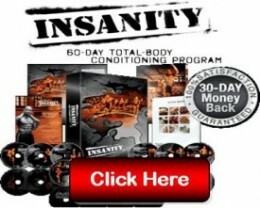 However, Insanity had 2 of the best ab routines around: “Cardio Abs” and “Insane Abs“. So how does “Ab Shredder” stack up? This is a 20 minute workout with 9 moves. But dont think this is easy! A couple of the moves last almost 4 minutes and 2.5 minutes each. The core is more than just your abs on your front. Your back is just as important, especially with all the plyo moves in The Asylum. I felt “Back to Core” was a really great workout in Volume 1. It was low impact, but high intensity. Who’s back was not on fire during the “Rotator Splt Lunge” or the “Swimmer Band Exchange”. Well,ShaunT switches between back and ab moves in this workout. His back exercise of choice is pull-ups. However, he does have an alternative move for those without a pull-up bar. 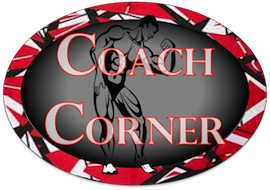 One of the hardest sequences is a 3:30 minute “Pulse-Up / Mountain Climber” sequence. I am literally pouring sweat at the end of that. Now here is my challenge. Do “Back & Six Pack” and “Back To Core” Back To Back (Pun Intended)! Championship in Volume 2 is the pinnacle of the program just as “Game Day“ was the pinnacle of Volume 1. And while I feel Game Day is harder (especially if you add OT), what makes Championship unique is that the FIT test is at the end of the workout. ShaunT’s motto in Volume 2 is that “The work doesn’t start until you get tired.” So putting your FIT test when you are 48 minutes into the workout is a bit sadistic. But in reality, if you are an athlete, this is the time that matters on the field. What makes this FIT test unique is not just the 3 minute physical push, but also the mental clarity that it requires throughout the sequence. Each “round” is comprised of an Agility Sequence that is not short and not easy to remember, along with (4) Power Jumps and (2) Burpee’s into X Jumps. in my second week, i got through 9 rounds, although my form was faltering in the last 3 rounds. My goal is 10, which would be one round every 18 seconds. Yikes! We will see if I can get there! Off-Day Stretch is your rest for the program. It was called “Relief“ in Volume 1. This is a true somewhat relaxing stretch workout. Recovery is critical in a high impact, high intensity program like this. However, I feel that Tony Horton has mastered recovery and I like his routines better. Between his Yoga routines and X2 Recovery + Mobility, I am set. (I love the Rumble Roller!) So while Off-Day Stretch is nice, I know some other routines work better for me. 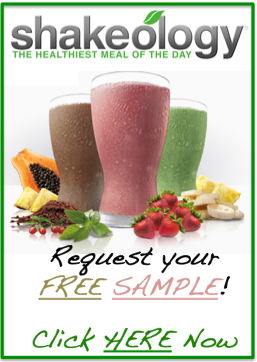 Pure Contact is the Bonus Disc when ordering through your Team Beachbody Coach. This is a 22 minute routine that puts you through 4 rounds of Agility and Pike-Up moves. This is a great supplemental workout. 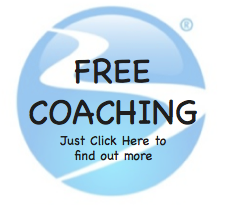 Additionally, it could work great if you are short on time! Thanks Carl!!! My Asylum Brother! Nice Mike! Keep it up! Awesome review!!! I am not afraid to dive in now. Its alot of fun! I’ll post my results after Week 4. I am on day 14 and I agree, this one is easier than Volume 1…..or is it that completing two rounds of p90x2 since Volume 1 has just made me more fit so that this one seems easier??? Hmmmmm……. Gina, Well that could be true! LOL! The 60 Day Hybrid they give you could also be a great schedule! 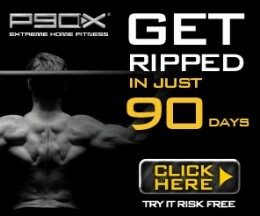 I will definitely be mixing these workouts in with some P90X, P90X2, Beast, etc. You only do Insanity workouts?